Panel Systems Inc., located just outside Washington DC, has grown into one of the most respected cold-formed metal framing companies in the USA – and it quickly became apparent during our interview process a key element of that success lies in the real, time-served, hands-on experience of its people, from the Owner/President right across the piece. This is a company that knows exactly what it is doing and isn’t afraid to embrace change to maximize efficiencies — and its reputation is such that Panel Systems was trusted with supplying the roofing structure for the Pentagon — badly damaged during the 9/11 attacks. 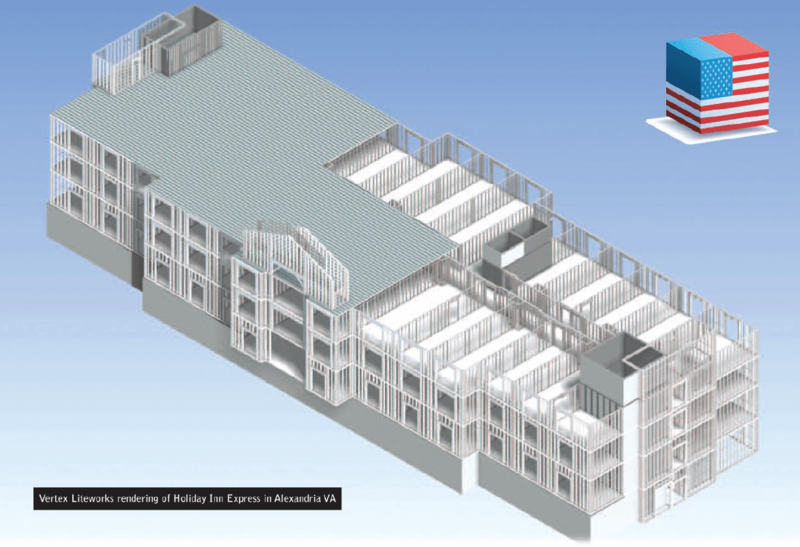 Now, this industry leader designs and fabricates lightweight steel framing systems for commercial, industrial and multi—family housing projects up to 10 storeys high. Senior CAD designer Dan Miller says the company “tends to stick to the East coast area of the USA, though we have completed projects as far as Texas and Kentucky.” The Vertex BD system for Light Gauge Steel is helping Panel Systems with around 75 major projects a year, working either directly with clients such as the big hotel and bank chains or as a sub-contractor. As with many companies in the construction sector, the past couple of years have been difficult — but as Dan points out ”We’re coming out on top now. Vertex BD is used for the production of wall panel shop drawings used to construct the panels, together with accurate bill of material reporting for estimating and ordering the wall panel components.